Only Academic edition-specific issues will be discussed in this section. For other editions of Memsource, please see the basic Getting Started guides. For more in-depth questions and support, please refer to our User Manual. Please note that this page is still under construction. If you have any suggestions or if you need any assistance, please contact Filip Sanca. If you've activated your Academic edition but do not know how to begin teaching with it, you're in the right place. Memsource Academic edition offers three different approaches. Choose the one that suits you best. Choose Approach A if you want your students to be independent and learn how to create projects, translation memories, and term bases. This will also mean less work for you. Choose Approach B if you want to have more control over what your students do and do not want to risk them cheating. This will mean more work for you, however, and your students will not be able to learn the project management features of Memsource. Choose Approach C to create a simulated translation agency within your department. This way, you can give your students a taste of what the real business looks like. Step 1: Create a PM account for each of your students by selecting Users and clicking New. If you want your students to create passwords themselves, do not fill in the password fields and use the Email Login function instead. You can also import a list of students from an Excel file using the Batch Import feature. Step 2: Go to the Editing window of each account (under Users, choose the name of the student and then click Edit). Select the values in accordance with this picture. Your students will only be able to access their own projects, TMs, and TBs. Step 3: Inform your students of their login details. Step 4: Have your students create their own projects by going to Create New and selecting Project. They can change the settings using this guide, but it is recommended that they do not. For easier orientation, we suggest that students name these projects using the following format: “Project [Student’s Name]”. These projects will be your students’ personal folders. Step 5: Have your students create their TMs and TBs by going to Create New and selecting either Translation Memory or Term Base. If you have already prepared a TM and/or TB for your students, send it to them via e-mail and have them import these into the new TM or TB that they've just created. They can do this by clicking on either their new TM or TB and selecting Import. For easier orientation, we recommend that students name them using the following format: “TM [Student’s Name]” and “TB [Student’s Name]”. These will be their own resources that no one else will touch. For further details, please review our guides on importing TMs and TBs. Step 6: Have your students attach their TMs and TBs to the projects they have created by selecting their project, scrolling down to either Translation Memories or Term Bases and clicking Select. Once this is done, the preparations are complete. Step 7: Once you have the assignment for your students, you can easily create a job for each of them inside their project by going to the Projects section and choosing their project. In the Jobs section, select New. Unfortunately, these have to be created one-by-one. However, you can also send the file to your students via e-mail and they can create the projects themselves. You don't have to change the File Import Settings, but more advanced users can do so using this guide. Step 8: As the Administrator, you will be able to monitor your students’ progress. Once they've finished their assignment, they should simply change the status of the job to Completed by Linguist. This is done by going to their project, clicking the checkmark next to their job, selecting Change Status, and changing the status to Completed by Linguist. Step 9: You can now download the finished files from your students’ projects by selecting their job and clicking on Download. Students MUST create their own projects, TMs, and TBs because they will only be able to see what they've created themselves. Students CANNOT have a shared TM or TB because only the first student to finish the task would actually have to translate it. Everybody else would have those translations suggested automatically and would not have to do anything. You can add as many Jobs to a project as you want. With every job, students’ TMs and TBs will grow and they will be able to benefit from what they have translated earlier. They will not be able to benefit, however, from what their classmates have translated. Step 1: Create a Linguist account for each of your students by going to Users and selecting New. If you want your students to create a password themselves, do not fill in the password fields and use the Email Login function instead. You can also import a list of students from an Excel file using the Batch Import feature. Step 2: Create a project for each of your students by going to Create New and selecting Project. You can change the settings using this guide, but it is recommended that you do not. For easier orientation, we suggest these projects be named using the following format: “Project [Student’s Name]”. These projects will be your students’ personal folders. Since you will not be assigning the projects to specific students now, having a specific naming format will be very useful in the future. Note: If you want to change them and want to apply all the settings to all the projects, you might find Project Templates (Scenario 1) useful. 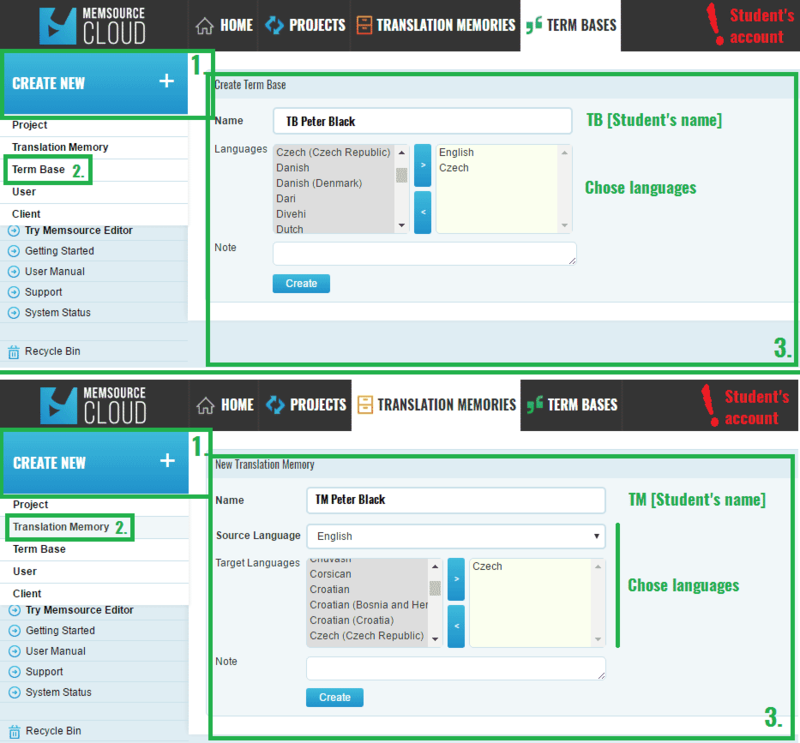 Step 3: Create a TM and a TB for each of your students by clicking on either Translation Memories or Term Bases and then selecting New. 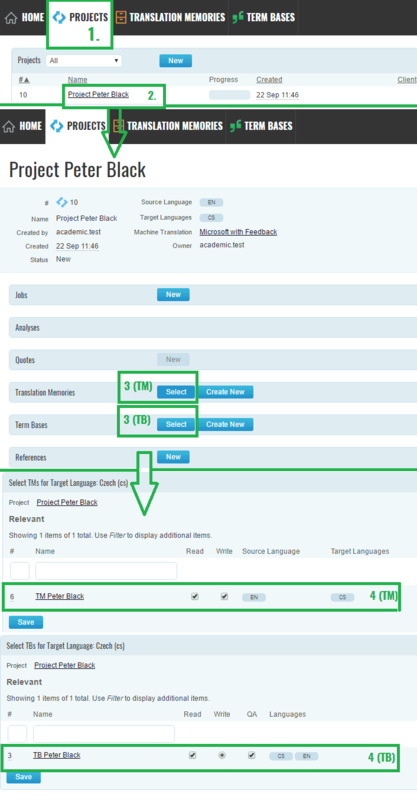 If you have already prepared the TM and/or TB for your students, import these into the TM or TB that you have just created by selecting either the translation memory or the term base that you just created and then selecting Import. For easier orientation, it is recommended that you name them using the following format: “TM [Student’s Name]” and “TB [Student’s Name]”. These will be your students' own resources that no one else will touch. 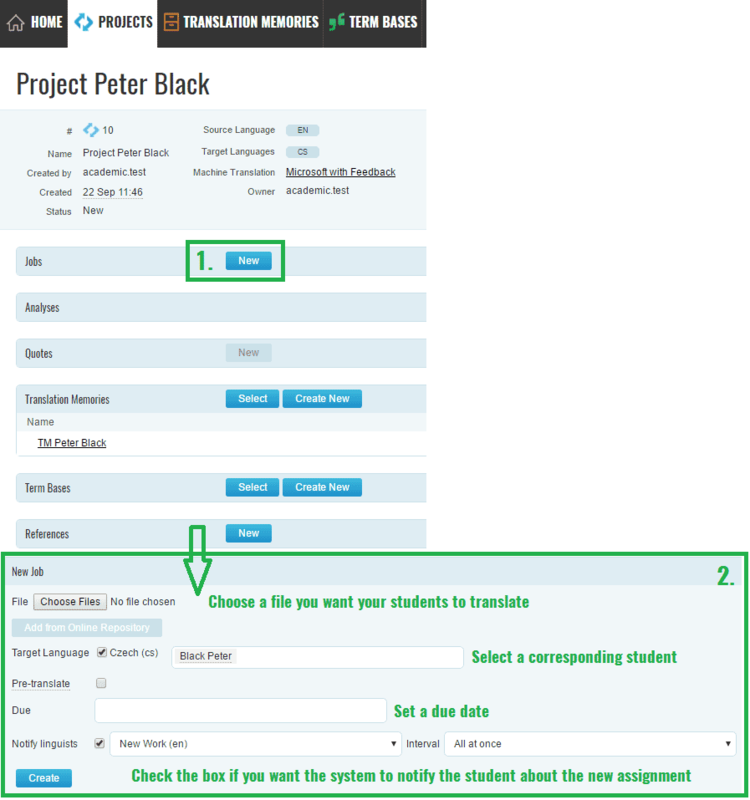 Step 4: Attach the students’ TMs and TBs to the corresponding projects you have created (for example, Peter’s TM and TB to Peter’s Project). You can do this by selecting your student's project, clicking on either Translation Memories or Term Bases and then Select. Once this is done, the preparations are now complete. Step 5: Once you have an assignment for your students, you can easily create a job for each of them inside their project by selecting their project and selecting New in the Jobs section. Unfortunately, you have to create these one-by-one. You do not have to change the File Import Settings, but more advanced users can do so using this guide. Step 6: As the Administrator, you will be able to monitor your students’ progress. Once they've finished their assignment, they should simply change the status of the job to Completed by Linguist. This is done by going to their project, clicking the checkmark next to their job, selecting Change Status, and changing the status to Completed by Linguist. Step 7: You can now download the finished files from your students’ projects by selecting their job and clicking on Download. Students CANNOT have a shared TM or TB because only the first student to finish the task would actually have to translate it. Everybody else would have those translations suggested automatically and would not have to do anything. They also CANNOT have a shared project, because only one of them would be able to accept the job. You can add as many jobs to a project as you want. With every job, students’ TMs and TBs will grow so they will be able to benefit from what they have translated earlier. They will not, however, be able to benefit from what their classmates have translated. For the repetitive creation of accounts, projects, TMs, and TBs, macro recording software like TinyTask can be very helpful. General tip for advanced users: If you have more lecturers in your translation department and want them to only manage their own groups of students, you can create a PM account for each of them with the settings described in point 2 of Approach A. After this, they can create their own groups of accounts using Approach A or B inside their own PM accounts. In this case, Approach B is recommended. If they opt for Approach A, the account administrator will have to give them the right to View projects created by other users, i. e. their students. This is done by going to the Users section. Select the checkmark next to the lecturers' names and click Edit. Under the Projects section, make sure that View projects created by other users is selected. This approach is unusual because it does not follow the common educational setup. On the other hand, it allows you to create a realistic environment that closely resembles the hierarchy of real translation agencies. Step 3: Using the Workflow feature, create different steps of the translation process that will fit your needs. Translation, Revision, and Client Revision are the standard steps. If you do not want to have more steps in your translation process, skip this step. Step 4: You or the Project Managers create user accounts for translators, reviewers, etc. One user can have all the roles at the same time, and both students and lecturers can have these roles. You can work with any language pair that your colleagues and students speak. For example, if you have pairs of students that speak the same foreign language, you can make them a translator–reviewer pair and let different pairs translate the same source text to various target languages. Why not swap the roles sometimes? The accounts you create do not have to be assigned to specific names—you can let your students try different roles. Use the deadlines to let your students know when their assignment should be finished. It is highly recommended that the same text is not translated more than once in the same language combination. This is because it will already be saved in the TM and no translation will have to be done the second time. You as an Administrator will be able to monitor all the processes that will be going on within the license. Lecturers from the Maastricht School of Translation and Interpreting have founded a network of such simulated agencies. Should this be of interest to you, feel free to visit their website. Special thanks to Mr. Joop Bindels from the Maastricht School of Translation and Interpreting and Ms. Maria Fernandez Parra from the Swansea University for sharing the details of how they set up these simulated agencies. A common problem you may run into is the fact that the Linguist account does not offer the full interface. If you want your students to be able to learn how to create projects, TMs, and TBs, you should create PM accounts for them instead. Don't create free Personal edition licenses for your students because then they will be unable to benefit from all of the features. Using the Personal edition, they would also be unable to store their past projects.